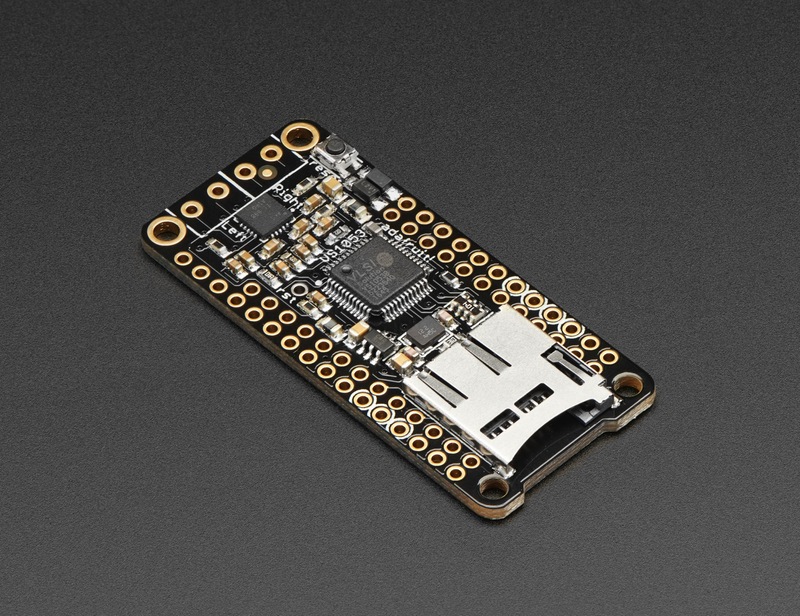 NEW PRODUCT – Music Maker FeatherWing w/ Amp – MP3 OGG WAV MIDI Synth Player – Stereo 3W Amplifier « Adafruit Industries – Makers, hackers, artists, designers and engineers! 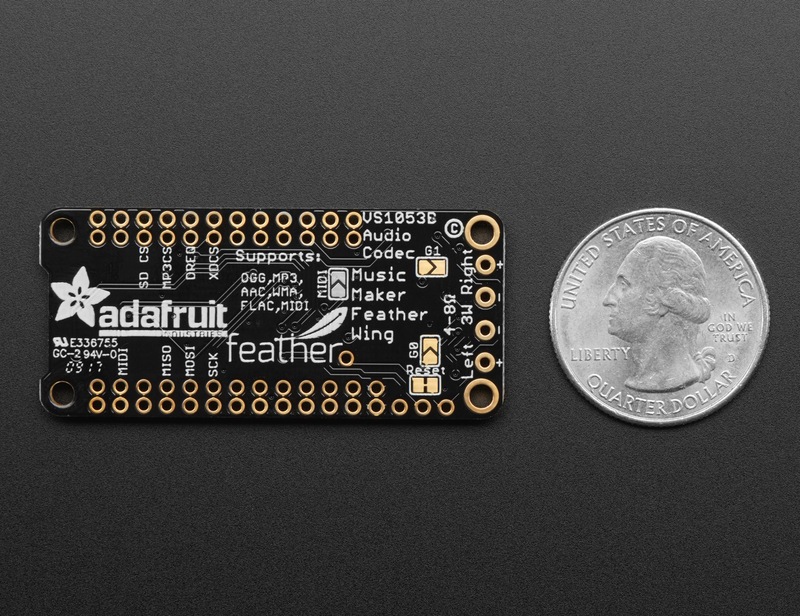 Bend all audio files to your will with the Adafruit Music Maker FeatherWing + Amplifier! It’s a fun-size version of our Music Maker shield for Arduino, and similar to our other Music Maker FeatherWing, but this one is even better – with an on-board 3 Watt amplifier! This powerful wing features the VS1053, an encoding/decoding (codec) chip that can decode a wide variety of audio formats such as MP3, AAC, Ogg Vorbis, WMA, MIDI, FLAC, WAV (PCM and ADPCM). You can do all sorts of stuff with the audio as well such as adjusting bass, treble, and volume digitally. 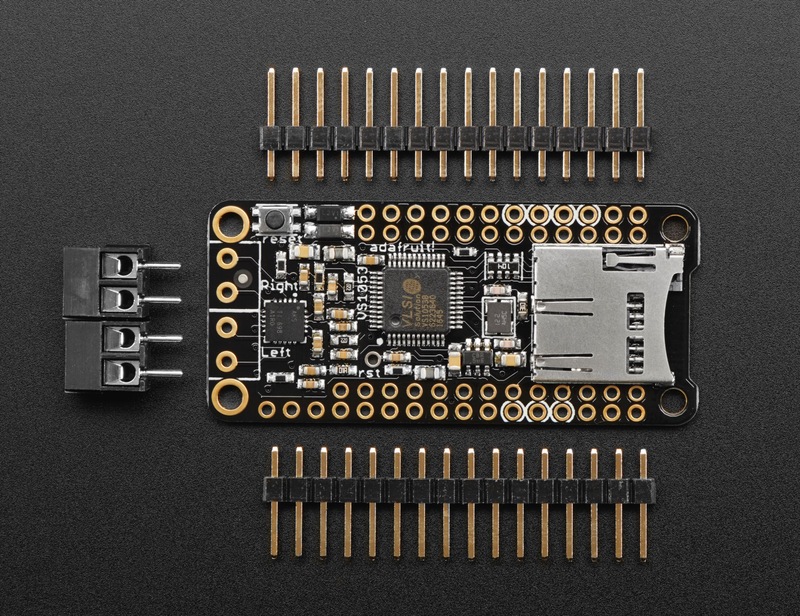 All this functionality is implemented in a light-weight SPI interface so that any Feather Board can play audio from an SD card. There’s also a special MIDI mode that you can boot the chip into that will read ‘classic’ 31250Kbaud MIDI data from the UART TX pin and act like a synth/drum machine – there are dozens of built-in drum and sample effects! What a great musical add-on to your Feather! That’s why we spun up this super FeatherWing, perfect for use with a any of our Feather Boards! Each order comes with one tested FeatherWing, two 2-pin 3.5mm terminal blocks, and two sticks of 0.1″ male headers to plug it into your Feather. 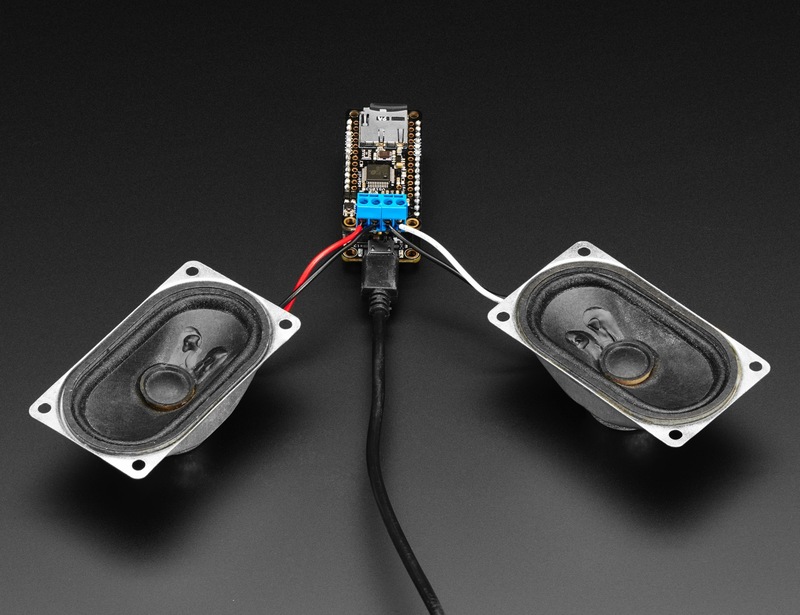 Some light soldering is required to attach the through-hole headers and terminal blocks to the PCB for plugging into your Feather Board and speakers. Once you’ve soldered the terminal blocks in you can connect any speaker you like, such as our 4Ω 3W or 8Ω 1W. Hey you can even use a surface transducer! Don’t forget to make sure you have a good strong 5V power supply – especially if you’re using the 3W 4 ohm speakers! Our 2.4A power plug is recommended.